We joke now about laser sharks and laser cats, but what if they were a reality? After reading about scientists who engineered laser-emitting biological cells, I'm fully prepared to welcome a weaponized pet into my family. A research paper, published by Nature, says that the scientists took Green Fluorescent Protein (commonly found in Jellyfish), and spliced it into human kidney cells, where it accepted the protein as its own. When flooded with weak blue light, these cells have the ability to output multiple beams of green laser light, which all emit the same exact band of color and all oscillate in unison. We demonstrate in vitro protein lasers using recombinant GFP solutions and introduce a laser based on single live cells expressing GFP. On optical pumping with nanojoule/nanosecond pulses, individual cells in a high-Q microcavity produce bright, directional and narrowband laser emission, with characteristic longitudinal and transverse modes. Lasing cells remained alive even after prolonged lasing action. 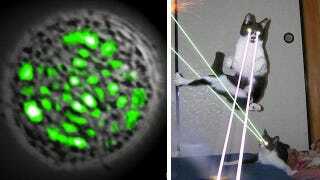 According to the BBC, the laser ability is limited to single cell output, meaning that the cells aren't yet able to link together as a complex system and coordinate their output. However, the laser is self-healing, meaning it can replenish itself after an extended period of light output.